Scalp necrosis in the neonate is not an unheard of entity. It however, poses a treatment challenge because the neonatal calvarium is not ossified, and the dura is in close association with the skin. The neonatal susceptibility to sepsis also compounds the issue. We present a case of neonatal scalp necrosis. The child was treated in the newborn period and was on a regular follow-up. The plastic surgery, pediatric neurosurgery departments together with the pediatricians were closely involved in the management. He subsequently developed new onset behavioral problems which, after ruling out other common neurosurgical aetiologies, was attributed to contractures in the split skin graft used in the neonatal period. He was operated on again, wherein a vascularized free flap (latissimus dorsi − LD flap) was used. His behavioral disturbances abated considerably post-surgery. We consider this case unique, as the long-term sequelae of neonatal scalp necrosis, and its management is rarely mentioned in literature. Further, the behavioral disturbances which could be attributable to the graft fibrosis were a feature worth mentioning. We would also like to highlight the need for multidisciplinary co-operation to achieve the best results in children. Scalp necrosis, outside of burns and aplasia cutis congenita, in the neonatal period is rare. There is no consensus on the best modality of treatment for scalp necrosis in the neonatal period. The aim of treatment lays emphasis on preventing the spread of the scalp defect, preventing the exposure of the underlying calvarium and dura and preventing secondary infection. This poses a real challenge in neonates due to the thin, unossified calvarium and the susceptibility of the neonate to infection and sepsis, thereby, leading to neurological sequela as an added insult to the initial injury. Often the children have features of hypoxic ischemic injury due to problems during delivery. Though much has been published about the management of aplasia cutis congenita of the scalp, there is a dearth of literature on the management of scalp necrosis in the neonate. To the best of our knowledge, we believe that our case is unique because it deals not only with the management of the condition in the neonatal period but sheds light on the long term sequelae and their treatment too. A term male child was admitted in the newborn intensive care unit due to a complicated delivery by an untrained personnel. Due to prolonged labor, to hasten the delivery, a vegetable paste comprising of papaya admixed with other ingredients was applied to the cervix. As the delivery failed to occur, the mother was taken to another facility for a C-section. However, because adequate anaesthetic facilities were unavailable, the child was delivered by the application of a vacuum forceps. The neonate had signs of hypoxic ischemic encephalopathy due to the prolonged labor. In addition, there was a raw area on the scalp due to the application of the vegetable paste. The child was managed by a multidisciplinary team (MDT) comprising the neonatologist, the plastic surgeon, and the pediatric neurosurgeon. The neurosurgeon was involved because there was concern about ventriculomegaly. Because the defect was large, the baby underwent a split skin graft to cover the raw area of the scalp. The baby did well. He, however, did have delayed development as a consequence to the hypoxic insult in the newborn period. He also had occasional seizures and was on treatment. His quality of life was good, and he was active and was not a burden on his caregivers. By the age of 3 years, the child was found to have new onset behavioral disturbances in the form of irritability together with a very severe attention deficit. All the conservative methods of management failed to alleviate this. The pediatrician was of the opinion that the new onset irritability was specifically due to fibrosis and contracture of the split skin graft. The opinion of the neurosurgeon was sought to rule out other causes such as hydrocephalus and secondary craniostenosis due to a chronic tight apposition of the calvarial bones by a fibrosed scalp. There was also a concern about raised intracranial pressure due to this. None of these were thankfully present. Hence, it was decided by the Multi Disciplinary Team (MDT) that the child would benefit by revising the previous split skin graft (SSG) and replacing it with a vascularized flap which would not only improve blood supply to the scalp but would also accommodate for the future growth of the calvarium. The child underwent a latissimus dorsi free flap (LD flap) which was harvested and grafted onto the scalp. The post-operative recovery was uneventful. Six months after surgery, the child underwent a repeat Magnetic resonance imaging (MRI) which revealed no new findings. The stigmata of the ischemia in the newborn period were still there, but there was no sign of raised intracranial pressure or hydrocephalus. The Evan’s ratio which is a measure of the ventricle size was normal. The calvarial sutures were patent. There was no neurological worsening. His IQ remained the same. His irritability was significantly reduced, and his behavior was much better. The free flap was of benefit to the child [Figure 1],[Figure 2],[Figure 3],[Figure 4],[Figure 5],[Figure 6]. 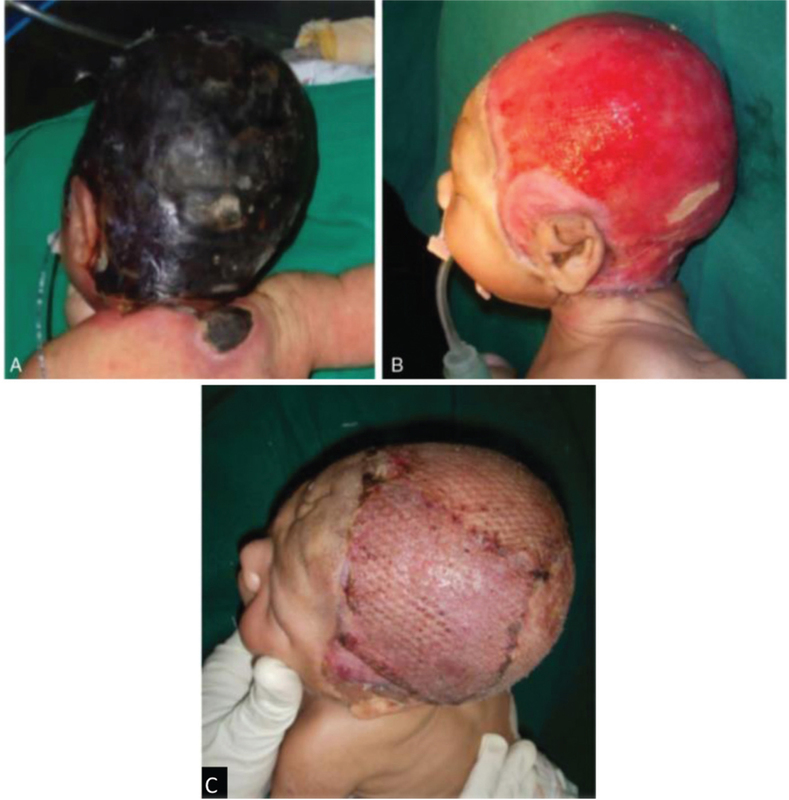 Figure 1: Neonatal scalp necrosis with placement of split skin graft. A -Neonatal scalp necrosis, B – Granulating wound, C – early post operative. 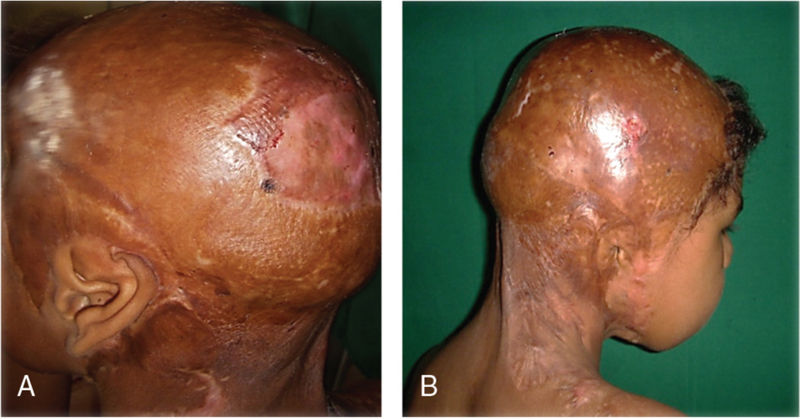 The use of skin grafts to cover scalp defects in plastic surgery is as old as the specialty. Scalp loss in the neonate has been reported due to the application of a variety of caustic substances. The substances used are as myriad as the cultures that populate the earth. Papaya (Caric papaya Linn.) fruit has been used to induce abortions since ancient times. Though the fruit is indigenous to South and Central America, it has spread throughout the tropics. Raw papaya, specifically the unripe epicarp, has high quantities of chymopapain, latex, and apolein which are known to induce uterine contractions though the exact mechanism is unknown. It is postulated that the extract has a very high content of proteolytic enzymes which inhibit progesterone and elevate oestrogen and thereby precipitate labor. In rural south India, the aqueous extract of the unripe papaya is frequently mixed with castor oil (Ricinus communis) and applied as a paste to the cervix. These can cause large ulcerations of the cervix, and if the os is open, can pass inside and ulcerate the skin of the presenting part of the foetus too. This, we hypothesize, happened in our case. Procedures in the neonate are usually aimed at achieving maximum benefit through the least invasive approach. SSGs are used frequently used as the first line in many defect closures because they are simple, reliable, and safe. However, they are associated with a higher number of re-releases due to their propensity to contractures. The use of microvascular free flaps such as LD flap, serratus anterior (SA) flap, combined LD and SA flap, and omental flaps are generally associated with better reconstruction outcomes because the vascularity is preserved through the pedicle and this allows for growth of the graft. The best replacement for scalp tissue is scalp tissue. Whence this is not feasible, flaps come into the picture. The role of growth factors such as beta-fibroblast growth factor, vascular endothelial growth factor, and platelet derived growth factor to prevent scarring, and scar contracture has been described in literature as is the use of the artificial dermis. None of these have been mentioned in the context of neonatal scalp reconstruction though. Expanded skin flaps too have their benefits. The differential diagnosis of aplasia cutis congenital of the scalp must also be borne in mind. This is a rare developmental condition where there is a skin defect of 3–4 cm, which may be associated with the absence of bone in some cases and is often associated with brain anomalies. These have a characteristic appearance. Intrauterine trauma, vascular compromise, infection and teratogenecity have been implicated. The correction of these defects has been described as both single stage and multistaged corrections. The long-term sequela after the initial correction in the neonatal period have not been mentioned in literature. Local tissue expanders in children have been associated with calvarial deformity as a long-term sequela. Conservative treatment of small scalp defects in the neonatal period has been advocated with success. 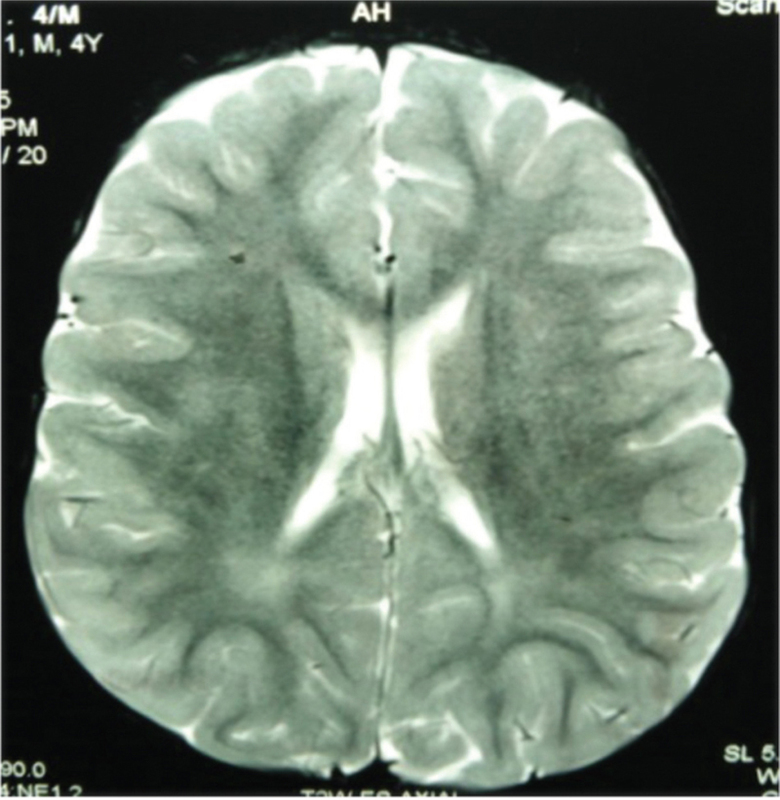 Brain assessment after a neonatal insult is predominantly aimed to check for ventriculomegaly. To help make rational observations various parameters have been developed like the Evan’s ratio and cortical mantle thickness. The ventricular index has been more reliable in late gestation and the neonatal periods. However, pediatric neurosurgeons now prefer serial head circumference measurements and serial ventricle sizes on Computerized Tomography (CT)/Magnetic resonance imaging (MRI) to decide about hydrocephalus rather than a single ratio. Brain scalp distance is a recent technique using MRI to predict long-term cognitive outcome. Neonatal scalp necrosis due to unsafe obstetric practices is unfortunately still a problem even in the 21st century in India. The children though badly afflicted can be salvaged through a MDT approach for optimal results. Long-term follow-up is a must because each child is special, and the treatment has to be tailor-made for each patient. Should the need arise, one must not hesitate to reoperate, so as to ensure good long-term outcomes. Split skin grafts in the neonatal period are associated with contractures at a later date. One must be weary of hydrocephalus, seizures, and secondary craniostenosis, and raised intracranial pressure from a neurosurgical perspective. Vascular free flaps have good outcomes in scalp defect reconstruction. Sumanth M, Ugendra K. Effect of unripe carica papaya on uterus. Int J Res Ayurveda Pharm 2013;4:345-8. Iwuagwu FC, Wilson D, Bailie F. The use of skin grafts in post-burn contracture release: A 10-year review. Plastic Reconst Surg 1999;103:1198-204. Furnas H, Lineaweaver WC, Alpert BS, Buncke HJ. Scalp reconstruction by microvascular free transfer. Ann Plast Surg 1990;24:431-44. Burkhead A, Poindexter G, Morrell DS. A case of extensive aplasia cutis congenital with underlying skull defect and central nervous system malformation: Discussion of large skin defects, complications, treatment and outcome. J Perinatol 2009;29:582-4. Bajpai M. Aplasia cutis cerebri with partial acrania − Total reconstruction in a severe case and review of literature. J Pediatr Surg 2003;38:E4. Yang JY. 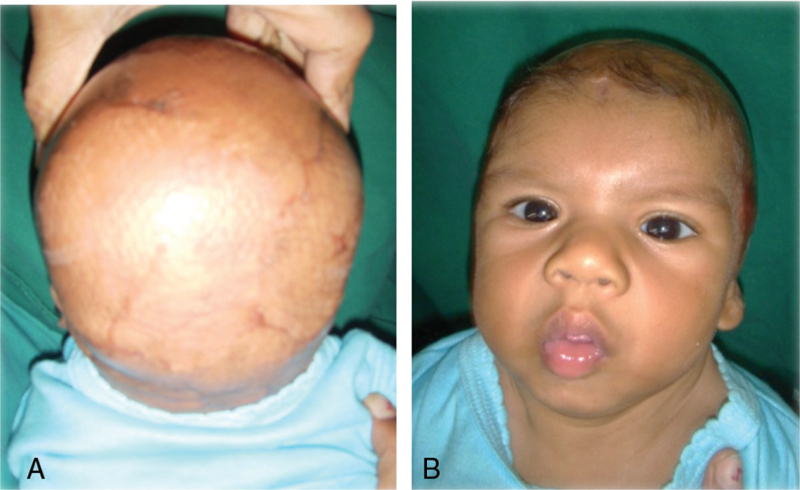 Large scalp and skull defect in aplasia cutis congenital. Br J Plast Surg 2000;53:619-22. Calobrace MB, Downey SE. Calvarial deformity and remodeling following prolonged scalp expansion in a child. Ann Plastic Surg 1997;39:186-9. Santos de Oliveira R, Barros Jucá CE, Lopes Lins-Neto A, Aparecida do Carmo Rego M, Farina J, Machado HR. Aplasia cutis congenital of the scalp: Is there a better treatment strategy? Childs Nerv Syst 2006;22:1072-9. Beauchamp MS, Beurlot MR, Fava E, Nath AR, Parikh NA, Saad ZS et al. The developmental trajectory of brain-scalp distance from birth through childhood: Implications for functional neuroimaging. PLoS One 2011;6:e24981.